Answering the question wasn’t easy, but what I learned was profound. Below is my story about how I chose this path, how I learned to trust my instincts, set my own goals, not follow for the sake of following and some advice for other young people that might be asking themselves the same thing. Ok maybe not the last one exactly, but it was approaching that when I graduated high school, and I wouldn’t be surprised if it gets to that point over the next decade. 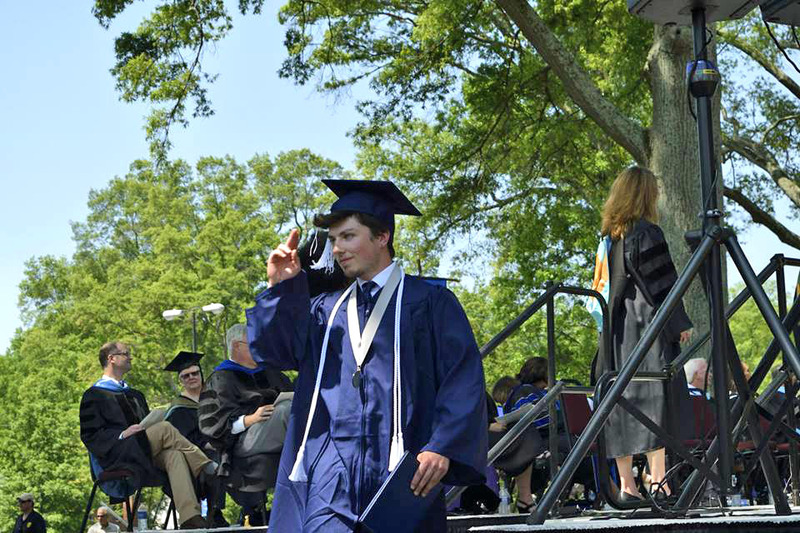 Throughout high school, I took the advice of following the standard path by working towards the next step of college; I was too wrapped up in school to think about doing anything else. And by the end of my senior year, I was in a good position to go to one of my top choice colleges. But in the process of finishing my senior year, I began to become suspicious of the idea that life was a predefined set of steps that everyone had to work through in order to achieve success and happiness. I was sick to my core of going to classes that I wasn’t particularly interested in, and I started to entertain the idea that surely there was a better way to do things. And thus, I began to think. I accomplished more at QØ in four months, in terms of content that I was proud to have my name on, than in most of my classes throughout my senior year. I was tired of school, but I really enjoyed surrounding myself with inspired people and working on cool projects for 12+ hours/day. Why couldn’t I do more of that? After a couple of months of mulling these thoughts around in my head, I ultimately decided to try to find a way to ease out of the system and start experimenting with alternative paths to success. A gap year seemed like a pretty low-risk way to do that, especially since I could go ahead and lock down a spot in college as an “insurance policy” and then just defer for a year. So I decided to give it a go, and it was by far the most transformative year of my life. Among other things, I learned to trust my instincts, set my own goals, and make my own path instead of blindly following others. This is the story of those experiences. It was the middle of my senior year when I began to think about how I could spice things up and challenge myself to step out of the cycle of chasing predefined “next steps.” This shift in mindset for me — away from being wholly focused on doing well in school and going to a good college — was the result of a variety of experiences, not the least of which was QØ. QØ laid the framework for me to begin to apply my own critical thinking skills to my life path, which led me to question whether I really wanted to follow my classmates to college the following year. The first, of course, is that it allowed me to not go to college directly after high school. This meant that I would have time to focus my energy on other opportunities outside of the context of a traditional classroom. I had many ideas kicking around about how I wanted to spend my time, such as learning to fly an airplane (seriously), and I was excited about the chance to put some of them into action. More on that later. The second is that I was feeling burned out from academic work and I thought it would be good to take a year off to relax and recover so that I wouldn’t become fed up with going to school. It’s not that I don’t like to learn… I think learning as much as possible about as many different things as possible is a worthwhile pursuit. But I prefer to learn on my own terms. I prefer to seek out the things that I’m interested in and pursue that knowledge until I’m satisfied with my understanding of it. I don’t like being force-fed information that I don’t find to be particularly interesting or relevant, only to be required to regurgitate it at a later date on a piece of paper that is likely going to end up in the garbage. And all for the sake of making a “good” grade so that I can convince someone else that I’m smart. In my opinion, that’s a terrible measure of intelligence. So taking a gap year seemed like a good opportunity to restore some level of tolerance for academic learning so that I wouldn’t completely lose it in college. With this in mind, I began to research potential programs that I could participate in on a gap year. My goal was to find a scholarship to travel, and long story short I ended up receiving the CBYX scholarship to spend time abroad in Germany. Upon hearing the news, I got confirmation from my university (Columbia) that I was able to defer, and started to get ready for my year abroad. I was pretty pumped at this point about the future, and I couldn’t wait to graduate to start my adventure. But by the time the summer came around, a small but crucial dilemma arose regarding my gap year plans. As I talked to more and more alumni from CBYX, I came to find out that the sponsors of the program were going to require me to go to high school in Germany. That’s right. High school. Lord help me. The thought of spending more time in high school was intolerable, regardless of where it was and who was paying for it. I was done with high school. I was faced with a decision: I could either accept the scholarship and embark on a low-stress year of studying in Germany on an all expenses paid trip… which meant that I would have to go back to high school… Or I could risk it all, turn it down, and be forced to assume responsibility for my own future. This was one of the hardest decisions of my life. I had a perfectly good, resume-enhancing, opportunity to spend a year in Germany, but I also had a rare chance to take a real risk and hopefully grow and develop in important ways as a result. Throughout the entirety of that summer, I employed the advice and guidance of many of my most trusted advisors, who included my parents, my brother Lucas, some old teachers, and one of my good friends Conor; their positions on the matter varied greatly, and I carefully considered each of their points. The seeds of clarity were planted one afternoon about a month before I was scheduled to leave for Germany. I had been asked by CIEE, the organization responsible for executing the program, a few weeks prior to fill out a questionnaire aimed at helping them place me with a suitable host family for the year. Some of the questions on the questionnaire included things like “Why do you want to come to Germany?” I happily filled out their document and responded to their questions with honest answers that articulated the fact that I had almost no interest in actually performing well in classes, and that I wanted to go to Germany to take time to learn about myself, explore Europe, and relax. I don’t normally respond well to people telling me what to do — you’ve probably picked up on that — and I especially wasn’t in the mood to hear such a response regarding the gap year that I planned to take specifically for the purpose of being able to make some of my own decisions. So when they sent me back that document and told me to redo it, it lit a flame of courage within me that gave me the clarity I had been searching for all summer. And within the same week, I sent the document right back to them, thanked them for their time, and declined the scholarship. That ended up being nothing short of the best decision I’ve ever made and has since catapulted my life onto a completely different trajectory full of stimulating experiences, explosive personal growth, and new perspectives. After turning down the scholarship to go to Germany, I immediately found a job and began saving money. I did whatever I could; I worked for my father’s construction company in the field, found work in various restaurants around town, and performed little technology related tasks for some of my neighbors. The tech tasks paid by far the best, and were much easier than working a construction job; I was thrilled anytime one of my older neighbors called for me to come set their new TV up. By mid-September I had about $4,000 in the bank, and I was anxious to get going. I did a little math and came to the conclusion that $4k was good enough to live a basic lifestyle for some number of months so I put my tent in my backpack and set off with a one way ticket to Amsterdam. The budget I had made prior to leaving did not account for money spent on expensive European hostels at 20 euros/night, so I made a Couchsurfing account and found someone to stay with in the outskirts of Amsterdam a few days prior to my arrival. Nour was a young Iraqi man who was the son of recent immigrants to the Netherlands. He lived in Schagen with Roo, his Dutch roommate from South Africa. I showed up in Schagen, which is about 25km north of Amsterdam at 11pm after taking almost two days to cross the Atlantic alone. I had a long layover in New York, where I walked the entire length of Manhattan from Columbia University to the One World Trade Center, and a long layover in Helsinki, where I sat on the steps of a church and fed pigeons in front of a Tesla Motors exhibition. One of my friends, Conor, who had been staying in the southern part of the Netherlands for the previous month wanted to visit Amsterdam and decided to meet me there. Without an internet connection, we wandered around the train station for several minutes looking for someone to point us in the direction of Nour’s house. We found an older man, asked him where to go, and set off. After stumbling around in near pitch black darkness for 45 minutes, we finally found Nour’s house. He was a large guy, with a welcoming smile, and a deep voice. He opened the door and invited us in. The lights were dimmed, there was loud music playing, and I could hear the chatter of a group of men around the corner. He gestured towards a spot near the door and told us we could drop our backpacks there. I shuffled a few pairs of shoes and made a little space before setting my bag down; then I proceeded into the rest of the house. The first thing I noticed was the light haze of tobacco smoke that filled the room. There were two couches against the walls, which were filled with a handful of large drunk Dutch men. They were all intensely focused on the TV screen in front of them that was plugged into someone’s computer playing music videos on YouTube, except for one guy who was rolling a cigarette. Empty beer bottles were scattered around the scene, Conor and I just kind of stood there waiting for instructions on what to do next. Let me remind you that I was 17, and had never been to a “house party.” The transition from my comfortable home in the rural mountains of North Carolina to Nour’s man cave filled with things that were illegal for people my age in the US but not in Europe, was abrupt to say the least, and I was a little rattled. But I had nowhere else to go so I grabbed a beer, mustered up a smile, and assumed my position on the couch. Conor and I ended up staying with Nour and his roommate for 3 days. He was a nice enough guy, but didn’t give a crap about us. We slept on the floor of his laundry room in our sleeping bags. I wanted to start with this story because it marks a clear shift in my life towards taking full responsibility for myself and my future. In a matter of 24 hours, my immediate support structure was reduced down to one person. While my independence developed considerably throughout the year, I began to learn very quickly to rely on my instincts to keep myself safe and healthy. There was no other option. This shift towards independence was transformative because it laid an important premise for having the courage to consciously make decisions that advanced my cause instead of blindly following others for the sake of comfort and conformity. Villava, Navarre, Spain, September 2015 — After one of my hardest days walking, some guys in the hostel and I climbed up on the roof of an abandon building to take pictures of the sunset. After leaving the Netherlands, I hitchhiked down to Spain to go for a walk. I chose the Camino de Santiago in Spain after a 10 minute Google search on the “best long walks in Europe.” I wasn’t sure what I wanted to do with my gap year, so I figured I would just walk until I figured it out. Walking gave me time to reflect, to learn about myself, to consider my deepest aspirations before making a plan to accomplish them. All in all, I walked over 500 miles on the Camino de Santiago from southern France to the western coast of Spain before I was ready to move on. In addition to continuing to refine my sense of independence, I learned a lot about personal decision making in Spain. To illustrate this point, consider that in the rural parts of northern Spain (mostly in the middle part of the country), the landscape is essentially a vacant expanse punctuated by consolidated and infrequent town-sized communities. As soon as you decide to leave a town on foot, you’re committed to continuing on until you reach the next town, which may be as far as 25km away — unless you decide to turn back, but where’s the fun in that? Now imagine that you are a young American “man,” you have only an intellectual understanding of how the metric system works, and you have a raging sense of adventure and invincibility that you are eager to express whenever and wherever the opportunity may present itself. This all added up to one evening early on in my journey, when I failed to comprehend how far “25km” really is; I can assure you that it’s is not a leisurely morning stroll, especially not with a 50lb backpack. By about 5 o’clock, I found myself in the middle of a deserted landscape, with no water, and no food; I had run out of both a ways back. I hadn’t seen anyone else for at least an hour, the sun was setting, and I had no idea when I could expect to arrive at the next town. So I just kept walking. And three hours later I stumbled into a town severely dehydrated and ready to collapse. There was a public water fountain on the outskirts of the town that I caught a glimpse of as I approached. I sprinted over to it, and stuck my head under the running water; the cool, soft texture of the water bubbling over my face was electrifying. The context of walking in rural Spain provided a framework in which I was forced to follow through with my daily decisions. This played a significant role in teaching me how to set my own goals, and follow through on those intentions because it allowed me to realize the power I hold in making a choice and seeing it come to fruition. On another occasion in Spain, I came upon a nice Polish man who was walking in the same direction and we struck up a polite conversation. He asked me about what I wanted to do in the future and I passively mentioned that I had been thinking about going to Nepal to see Everest Base Camp. Upon hearing this, his face lit up, he pulled out his camera, and he showed me many pictures of when he had visited Nepal a few years prior. I decided right in that moment that I was going to go, which was one of the most liberating experiences of my life. At 17 years old, I consulted a grand total of 0 people about my decision to go to Nepal; I was independent, responsible for myself, and able to make my own decisions. By the time I spoke to my parents, my non-refundable flights were already booked. The frigid wind rushed by, blowing my untamed hair into a perfect mess. The truck’s engine spat and roared as it fought through a foot of fresh snow piled high on the mountain road crudely carved out of rock and earth. As the road steepened and the ice thickened, the truck’s onerous crawl ground to a slippery stand still. The snow-capped peaks of the Himalayas dominated the landscape with their towering majesty and stood as a clear reminder of who was ultimately in charge. The yells and cries of my Nepali team rose up over the truck’s groans as we started to slide backwards towards the 500 meter unguarded cliff. Raj, the driver, poked his head out the window, spun the wheel, stomped the emergency brake into action, and brought the truck to a decisive halt about a foot and half from the edge of the road. A deafening silence fell over the scene as Raj turned off the truck; then we all jumped out to start digging. Laprak, Nepal. January 2016. The time I spent in Nepal was the culmination of everything I had learned about setting my own goals and having the courage to follow through on those promises to myself. To start, my trip to Everest Base Camp was actually relatively uneventful. Other than flying into to Lukla Airport, the most dangerous airport in the world, and slipping a few times on a narrow mountain ledges, it was honestly just a lot more walking. A quick note about Lukla Airport: Picture a runway that is about as long as a football field built at a 12% grade on the side of a mountain. There is no radar, air traffic control, or navigational aid; pilots have to hand fly the plane all the way in, and if they mess up, the plane will slam into the side of the mountain. Between 2008 and 2013, there was roughly one fatal crash per year at Lukla (plenty more around the country, especially among helicopters trying to fly in the mountains). I tried to limit my exposure to such statistics prior to making the trip. Anyway, I survived the flight into Lukla and spent three weeks taking the roundabout trail to Base Camp —the direct trail only takes 7 days, but is less challenging and exciting. The only thing I feel compelled to say about that journey is that you would be a fool to make it to your grave without seeing the sobering majesty of the Himalayas. I had never seen such a stunning landscape before, and I am very confident that I never will again. Gokyo, Nepal, November 2015 — Coming up and over Renjo La Pass @ 18,000 above sea level. Sagarmatha (Mt. Everest) is the large peak in the middle. The more significant development during my time in Nepal was related to a volunteer effort that I led from December to February in Laprak. On Christmas Eve, as I was sitting in a local coffee shop, I read a newspaper article about the devastation caused by the earthquake that had struck in April 2015. The article described high altitude refugee camps in which people were dying from exposure after losing their houses. 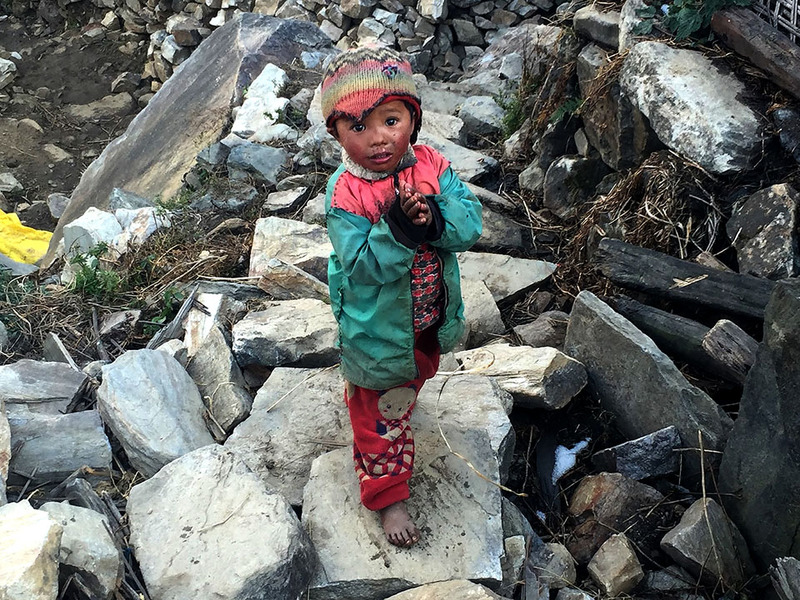 The road conditions in rural Nepal rendered the camps nearly impossible to reach by truck, a problem that severely limited access to basic relief supplies like medicine and blankets. So I packed my things and headed further north into the mountains towards the epicenter of the earthquake to see how I could help. The temperature dropped to 10 degrees Fahrenheit as I spent two days climbing endless Himalayan staircases snaking up into the mountains. I eventually arrived, panting and shivering at 10,000 feet above sea level. I found a large camp of displaced people who had come from the village of Laprak in the valley below. The old village of Laprak had been destroyed by the earthquake; one of my friends took me down to the old village one day and showed me his house. It had been reduced to a pile of stones and wooden beams, indistinguishable from other piles beside it. There were large cracks in the ground, and visible scars on the mountain side where the earth had literally separated from itself in a violent fit of tremors. The new camp, an hour’s walk up the mountain, consisted of about 3,500 people living in temporary shelters built out of corrugated iron, wooden poles, and plastic tarps. Imagine if you were going camping, but had to stay in the woods for an indefinite amount of time. That’s essentially how a lot of these people were living. When I arrived, I stumbled into the camp and looked around for a place to put my own tent. The locals were obviously surprised to see me, and eventually, as I continued to wander around, a few guys sitting up on the hill drinking tea got out of their chairs and yelled at me to see what I wanted. I pointed at the ground below me— at this point I had found a relatively flat place — and asked them if I could set up my tent there. They were perplexed, but agreed to let me have the spot and mosied down to offer their assistance. Then they brought me to the local “English teacher,” Ganesh, to have him sort me out. Between the teacher’s pieced together English and my broken Nepali, I was able to gather a decent sense of the condition of the camp. Long story short, there was an obvious lack of basic supplies to ensure the survival of the everyone through the winter. I have two important memories from some of my first days there that illustrate this point well. The first such memory is of Sangam, the three year old son of Ganesh, who had recovered from three separate cases of pneumonia in the past two months. With the temporary health post exhausted of basic medicine, it wasn’t clear whether or not he would make it through a fourth. The second memory took place during my first evening when I was looking for something to eat for dinner. Ganesh had taken me to one of the families who lived next to him, and when I walked into their shelter, my face was hit with a wall of smoke that seared my eyes and left me coughing as I took a seat on a piece of wood next to the fire. I ended up eating with them that evening, and as I was on my way out, I observed how they had managed to stay warm throughout the night despite plunging temperatures. With a fire built in the corner of the shelter to heat the inside air, they slept on the ground below the smoke line to avoid suffocating from the fumes. I am not naïve enough to think the world is a perfect place — one could devote a hundred lifetimes to solving the world’s inequality problems and still only begin to scratch the surface. I initially brushed off the immense suffering and misfortune I found in Laprak as just another example of how messed up the world can be. 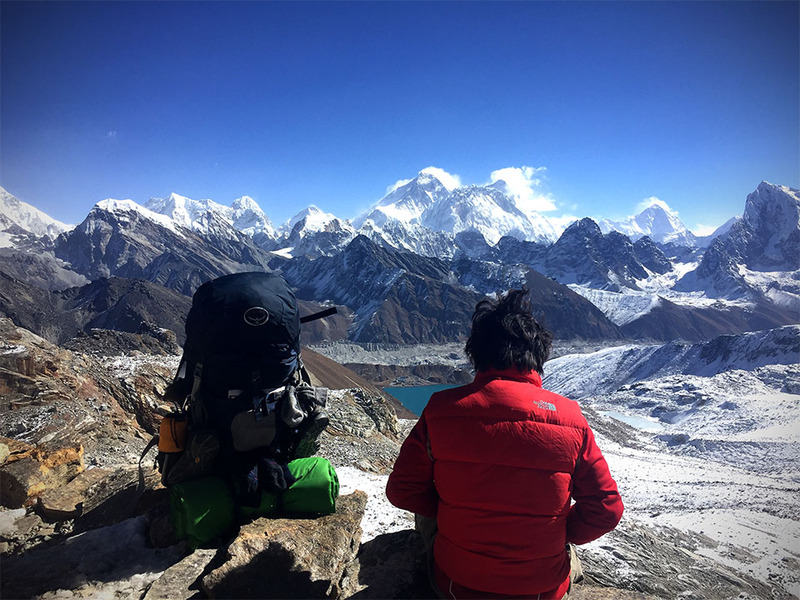 But the culmination of all of my experiences leading up to this point had equipped me with an unprecedented level of courage and resolve in my own life, and I knew that I would be unable to leave Nepal knowing that I had done nothing to help. So I made the decision to take action. Laprak, Nepal, January 2016 — Taken in the old village of Laprak when I went down to see the damage. It was about 25 degrees outside in this moment. I returned to Kathmandu and got busy figuring out how I was going to make it back with relief supplies before the brunt of the winter had fully set in. I started a fundraiser online and, with the help of my family and friends back home, raised almost $7,000 in about 3 weeks. I enlisted the help of some of my local Nepali friends and devised a plan to buy and deliver medical supplies to Laprak via the combined efforts of a 4-wheel-drive lifted “tank-truck” and porters on foot. Two weeks after my initial visit to Laprak, I arrived to within a 30-minute hike of the camp, with enough basic medical supplies and other essential goods to help the 3,500 people of Laprak through the winter. My Nepali friends and I drove all through the night to make it up the mountain before the high altitude sun turned the rural mountain road into an impassable river of slush. It had snowed all night, and as we neared the camp we had to spend just as much time digging as driving to be able to move forward. But we made it. And as I was leaving the camp a few days later, the director of the health post, Anarda, came running over to my friend Tej and me standing by the truck. She was wrapped in clothing to protect her from the harsh sun and bitter cold, and was smiling enthusiastically. She took my hand and began speaking fluent Gurung to me, the native tribal language spoken by communities near the Manaslu mountain range in Nepal. I sent a look of distress to Tej to elicit his services as an interpreter. Laprak, Nepal, January 2016 — Taken on my second trip up to the camp when we delivered almost 2,000kg of fresh mustard oil, and basic medical supplies. Intent is only real when you are willing to do what it takes to make it happen. Before I continue, I would like to say that I felt like my involvement in Laprak in the form of imported resources was necessary for several reasons. The first, and perhaps the most important, was the fact that the Nepali government had been unable to get organized in the aftermath of the earthquake to effectively relieve the suffering of people living in more remote areas around Nepal. The situation around the country had also been alleviated by private organizations such as Oxfam, and the Red Cross, but the bottom line is that it wasn’t enough, especially not high in the mountains where temperatures were significantly lower at night than elsewhere. Ultimately, thousands of people were confronting life threatening conditions in Laprak, and it didn’t seem like anyone else had the capacity to help at the time. I am a big supporter of sustainable and responsible humanitarian practices, but in this case, in the context of an emergency, I was much more concerned about just providing as much relief as I could. My experience in Laprak has doubtless been the most defining experience of my life; I am a completely different person than I was a year and a half ago. A lot of the positive developments that I have noticed in myself have taken shape along the same lines that have transcended this story. The lessons of trusting my instincts, making my own decisions, and having the courage to follow through on my intentions, are all lessons that took hold within me in Nepal. My time in Nepal refined my sense of hard work and intention. When Anarda was telling me about all the people who had promised to return to Laprak to deliver medical supplies, and failed to do so, it awoke within me a keen understanding of intention and the path to success. I have developed a bitter distaste of empty promises — not necessarily the kind of empty promise that I make to others — I’m talking about the empty promises I make to myself and then fail to uphold. My experiences in Nepal instilled within me a visceral opposition to articulating an intention to myself and then failing to see it through. Before I decide to do something, I have to make sure that it is something I actually intend to do. And if it is, then I’ll be damned if I fail to uphold that promise to myself. That attitude is the only reason I succeeded in accomplishing my goals in Laprak, and it continues to define how I spend my time now. Similarly, I learned that I have the power to affect real change in the world. My life is not a passive spectator event where I’m condemned to watching larger players make consequential decisions. This is a very liberating mindset, but it’s also a lot of pressure. Every second of every day is an opportunity to advance my cause and work towards a larger goal. There’s no time to waste! One of my current projects is finding a balance between answering this call to action and taking time to relax and appreciate the present moment. On a less positive note, I find it much more difficult to relate to people now than I did 18 months ago. I have developed an intolerance for small talk, wasted time, and excuses, which all seem to be staple elements of socializing in college. I remain optimistic that this aspect of my life will improve moving forward; I’m a completely different person than I was before I left for Spain, and I need to allow some time for my social life to evolve alongside me. The quality of one’s relationships is perhaps the single most important factor in deciding whether or not an individual is happy, and I’ll be thrilled when I can figure out how to go back to having a more healthy social experience. I have mentioned my current social experience to make this point: the only way to radically grow as a person is to expose oneself to deeply unsettling and challenging experiences. You will benefit greatly from the lessons you learn, but there may be less-than-positive side effects that will have to be remedied in the process. Living life is working through those side effects, which can sometimes prove to be just as difficult as living the experiences that brought them. To wrap this section up, I decided to pack my things in Nepal in the early days of February 2016 and head to Thailand. I had accomplished my goals in Laprak and had a nagging sense of a need to move on. There is enough humanitarian work in Nepal to keep an army of people busy for several lifetimes, but at some point I had to be honest with myself in saying that I wasn’t prepared to spend my whole life in Nepal and February seemed like a good to pack up and move on. So that was it. I said my final goodbyes to my Nepali friends, asked them to send me updates on the status of Laprak, and hopped aboard a Thai Airways flight from Kathmandu to Bangkok. Koh Tao, Gulf of Thailand, February 2016 — Tropical storm rolling in as the sun sets on another day of dive lessons. I stepped off the plane in Bangkok, stumbled through the airport, and found my way to a taxi outside. As we drove to a nearby hostel, the sights and sounds of a modern city left me shell shocked. Just 24 hours ago, I was sleeping in a temporary shelter in one of the most remote villages in Central Asia, and now I was surrounded by modern highways, towering skyscrapers, and pictures of airbrushed women on billboards. I have experienced culture shock in my life, but nothing like how I felt for the first few days in Thailand. This, combined with an ongoing intestinal infection from less-than-clean water in Nepal left me feeling like washed up sea litter from the beaches of Cancun after college spring break season. I spent about 4 days in Bangkok sleeping and eating mango ice cream before deciding to head down to the islands in the Gulf of Thailand to sit on a beach, catch some sun, and formulate my next move. I booked an overnight bus ticket to a small port in the southern part of the country, and hopped on a large ferry from there. Three hours later, I stepped off the boat onto Mae Haad Pier in Koh Tao, which is a small island in the western part of the Gulf of Thailand. It was well above 80 degrees outside; the sun was beating down on my head, and the water below me was as clear as glass. The dense sea-level air filled my lungs with each satisfying breath. After spending months in alpine terrain, surrounded by ice capped peaks, rocky glaciers, and snow, the soft beaches of Koh Tao were a welcome, yet shocking, change of scenery. Koh Tao is known for its plentiful scuba diving, which I didn’t know before I showed up. As I was walking around the main beach area during my first evening there, this became very clear to me; you can’t walk more than 10 minutes in any direction without encountering another dive school. I took note of this fact, but had no initial intention of taking advantage of the opportunity to dive for one simple reason: I do not like to swim. I just really don’t like it. I prefer to keep both feet on solid ground, and preserve my ability to move across land as my body was intended to do. But after spending a few days sitting around on this little island in the middle of a large body of water, eating Pad Thai for $1/plate, I became restless and decided that learning to dive would be an excellent opportunity to get over my distaste of water and embrace my inner fish. Thus, this story of relaxation on a beach in the middle of Southeast Asia becomes a self-taught lesson in how to confront and accommodate fear. Fear is the single greatest inhibitor of personal success that I know, and it is important to experience fear often enough to be able to identify it and work alongside it when it inevitably arises. The relationship that I have with fear now is not one of dominance. I have little interest in fighting or diminishing my fear. Rather, I use my fear as a measure of growth, and I try to make a habit of seeking out things that make me uncomfortable. That was a major premise of my entire gap year; I spent a decent amount of time just wandering around looking for opportunities to be scared. Spending so much time on the edge is what allowed me to learn about and develop myself so rapidly. So I signed up to take classes at Big Blue Dive School one afternoon, one of the largest diving centers on the island, and then went to eat more mango ice cream as I read about how I would have to descend to 60 feet under water multiple times to pass the course. And after spending a few days in the classroom going over the basic material, the day arrived to actually dive. I looked over at my dive instructor. He was standing next to me with a big smile on his face giving me the “ok” signal. I took a deep breath. The regulator in my mouth (the device that delivers air from the tank on your back to your lungs) seemed to be working. I took a couple more breaths just to make sure, and then stepped up onto the side of the boat. The waves swooshed back and forth about five feet below me and rocked the boat. I eyed them suspiciously and began to rehearse the words of my instructor from just minutes before. “Put your hands over your mask to hold it in place, bite down on your regulator, and just fall into the water,” he had said. “Just fall into the water.” Right. Simple enough. “Just fall into the water.” So I turned around with my back to the ocean, gave a salute to the other divers on the boat, and inched backward until there was nothing but thin air between me and my fear. The diving was incredible. Spending 20 minutes at a time suspended “in thin water” with a ton of fish, diving in and out of coral reefs, and getting up and personal with large sharks is other-worldly. As was typically the case throughout my gap year, the images I had seen on the internet of the underwater world only captured a small fraction of its majesty. Find the nearest dive center and give it a try; you will not be disappointed. The point of this story is two fold. The first is related to rendering the experience of fear a familiar one so that you are not put off by it when it comes. No one is immune to fear. No one “conquers” their fears and then lives happily ever after. Fear is something that, at best, you can learn to work with, and ideally take advantage of. I am by no means finished with the process of becoming more familiar with fear, but thanks many of the choices I made throughout my gap year, I think I’ve made a lot of progress. The experience of fear is an opportunity to grow, so embrace it. The second point of this story relates to the question of what to do when you know not what to do. When nothing piques your interest and you can’t seem to ignite your passion, what should you do? I went through a phase towards the end of my junior year and throughout my entire senior year of high school when I just lost interest in everything. I still worked hard and did well in school, but I was going through the motions. There was no real intent or interest. One approach is to do nothing. 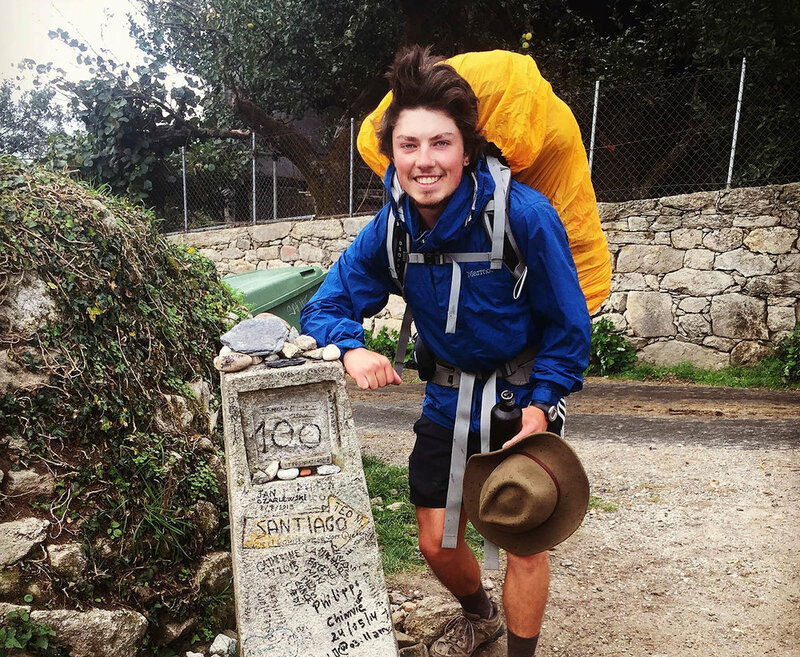 I chose to spend a month walking clear across Spain because I had no idea what else to do. I couldn’t find a sense of clarity about what I was drawn to and how I wanted to spend my time, so I packed up, flew across the Atlantic to get away from the distractions, and just started walking to clear my head. Twenty-five days later, I had a stroke of clarity about going to Nepal and I acted on it with more urgency and purpose than almost any other time in my life. The other approach is to do everything. After Nepal, I felt lost again. I showed up in Thailand sick, culture shocked, and deeply changed by my experiences in Laprak, and I had no idea what to do next. So I sat around for a few days in Bangkok, then sat around for a few days in Koh Tao, and then randomly decided to learn how to dive. Besides building on my experience with fear, there was no good reason for me to learn how to dive. But when you’re not sure what else to do, you might as well sign up to do a bunch of different things until you find something that really speaks to you. By striking the right balance between doing nothing and doing everything, the illusive next step will surely present itself in due time. And when it does present itself, you must have the courage and confidence to trust your instincts and act on it with explosive intent. For me, after spending more than a month in Thailand, a week in Vietnam, and a few days in Japan, that next step was going to flight school to earn my pilot’s license. Wheels up! Asheville Regional Airport, North Carolina — My first solo in Cessna N2055R. Now that we have arrived at the final stage of my gap year, allow me to briefly re-articulate the message that I am trying to create through this article. I started my gap year on a suspicion that the pre-described path that is always taught to us throughout school might not be the only way to achieve success and happiness in the world. By the end of my senior year, I was restless, tired of sitting in a classroom, and eager to ride under my own power for a little while to learn about myself and grow as an individual before college. The experiences I lived throughout my gap year taught me many lessons, not the least of which were to trust my own instincts, to have the courage to follow through on my own intentions, and to not follow others for the sake of following. All of these lessons became ingrained deeper and deeper into my psyche as I advanced throughout the year, and ultimately culminated in my decision to head home in the early weeks of March 2016, find a job, and learn how to fly. Flying has always been my thing. When I was 9 years old, I was riding in the car on the way to a soccer game with my father. As we approached the local airport, I looked out my window and caught a glimpse of a sign that said “Learn to Fly Here.” I had never seen this sign, and it hadn’t occurred to me previously that there was a flight school so close to our house, so I begged my father to bring me back after the soccer game so that I could see what it was all about. My parents have always been the type of people to support me through whatever I want to do. They exert very little influence in terms of helping me make decisions, but as soon as I articulate an intention and start acting on it, they are always standing by to support me. I attribute a great deal of whatever success I have achieved in my life so far to my parents for this very reason. And even at 9 years old, my father agreed to take me back to the flight school to watch the airplanes, speak to the instructors, and get a sense of what it was all about. When we arrived in the building, we were greeted by a man named Ben. I have forgotten his full name, but he ended up being my first flight instructor. I couldn’t have been more thrilled to even be standing so close to someone who could teach me how to fly. “How old do you have to be to learn how to fly?” I asked. Ben explained to me that there was no minimum age to begin flight training, but you had to be at least 17 to hold a license. To be fair, my parents did end up paying for the first lesson as a gift for my 10th birthday. My parents also bought me the Jeppesen Private Pilot Manual when I was 10, which is a 500 page textbook that details everything that you need to know to become a Private Pilot. So on a cold October morning in 2007, I climbed up on a stack of pillows in the “pilot of command” seat of Cessna N2055R and began my pilot training. Throughout the following two years, I did whatever small chores around the house I could find to earn a few dollars here and there to take more lessons. My parents were very generous in coming up with things for me to do to earn flying money, but at almost $170/hour, it took me months to have enough. Eventually, I just decided to just wait until I was older to continue on. As I previously said, I had entertained the idea of getting my pilot’s license the summer before I left for Spain, but I never had the gumption to actually make it happen. I was quick to come up with excuses about how expensive it was and how I probably wasn’t going to be able to use it much even if I did get it, which are all valid points to be considered. But as I emerged from 7 months all over the world, I was equipped with a new perspective on what I could accomplish. With enough genuine intent, I knew that I was capable of anything — so I made a plan to earn the money, signed up full time at the local flight school, and worked hard at multiple jobs for 6 months to see it through. And nine years after my first lesson, in late August of last year, I passed my Private Pilot checkride and received my certification in the exact same aircraft, Cessna N2055R, as I had originally begun in all those years before. “I suppose,” she said sheepishly. I made some final checks, reached for the throttle, and set it to full power. The engine roared as the plane lurched forward and thirty-seconds later we were flying. I had been telling her that I was going to be a pilot for more than a decade, and there I was, nurturing the aircraft higher and higher into the sky against the backdrop of the setting sun. That was one of the proudest moments of my life. So after all that, here I am: sitting in my college dorm room studying entry level political science six days a week. If there’s one thing my political science classes have taught me so far, it’s that I’m really not interested in political science right now. It’s a drag to get up every morning and go to class. I almost always emerge from my two to four hour lectures thinking about what I could have accomplished instead of spending my time listening to a lecture about the artificial construction of national identities. I’m sure those lectures are very interesting to many people, but it’s not for me at this point. And yet, I’m still here. Why? Why did I come to college, and why have I decided to continue spending my time here (so far)? After all that I’ve said about having the courage to follow through on your own intentions instead of following someone else’s prescribed plan to success, how can I reconcile those lessons with my recent pattern of nothing less than complacency? I’m still not sure. I enrolled in college before I left for my gap year, and decided to make good on that promise last fall because I wasn’t sure what else to do. I also still have a nagging sense that a prestigious four year degree is going to get me somewhere that I couldn’t go without it. But is that really true? Or is this just a massive waste of time? As I progress further through this college experience, I’m growing more and more suspicious that it is indeed the latter. So what’s the next step? Glad you asked. I have been considering what it might be like to drop out of school. I’m not ready to do it yet, because I don’t want to make a brash decision that I’m going to regret a few years down the line. But it’s still something I’m considering. The immediate plan that I’ve come up with is to look for opportunities other than school until I find something that really speaks to me. I can’t just drop out of school with nothing to do and go sit at home for 6 months until I figure it out. But, if I can find an inspiring job, or stumble upon a stroke of inspiration that leads me to pursue my own company, then dropping out to pursue those goals becomes a much more realistic option. To accomplish this, I’ve been reaching out to the extremities of my network to get in touch with people who I know are always up to interesting things. I’ve also been sending cold-emails far and wide to try to create as many opportunities for myself as I can. This strategy has been mildly successful so far; I currently have one promising summer job pending in Zurich, Switzerland as a result of this strategy, which could lead to a more long term opportunity if it ends up working out. Ultimately, I’m trying to strike the right balance between doing nothing and doing everything. In a time of uncertainty, it’s important to be patient. I’m “doing everything” in the sense that I’m trying to put myself out there by reaching out to my network to see if any leads open up. And I’m “doing nothing” by cruising through the motions of school while I take time to think. So far, college is not particularly difficult or stimulating; it’s a chance for me to feel productive while taking time to collect myself. I also go to the college on the French Riviera, where the weather is nice and the wine is cheap. It’s not a bad place to be patient. One goal of this article is to reach out to all of you as part of that “doing everything” strategy. I would love to hear about what projects you’re working on and what has inspired you recently; you can contact me through social media, or by sending an email to the address below! If you’ve dropped out of college, drop me a line to let me know how it went. I want to hear about your experiences, the good and the bad, so that I can have a better idea of what the best next move might be for me. Even if you just have a cool story to tell, or a question or comment about any part of my story, let me know. I’m always up for good conversation! Follow me on Instagram @kayolord; you won’t be disappointed. email me k.gaylord at columbia.edu. Give me a phone call, that takes guts, +33 6 79 39 45 86. And check out the latest finance project I’ve been working on with a team in Philadelphia @ www.dynalect.com ! Should you take a gap year? that’s a good question that only you can answer. A lot of what I have written about describes my own experiences and journeys, but it should be known that there are many incredible people scattered all over the planet who have supported me to no end over the past few years. To think that I have accomplished anything or grown as an individual completely by my own accord reflects a misunderstanding of what has made me who I am today, so I want to express my gratitude to all the people, most notably my parents, who have been there for me when I needed it most. To Mom, Dad, Lucas, Isabella, Conor, Ganesh, Tej, Bella, Jared, Etinosa, Tara, Catalina, Chris, Jay, David, Diane, Nancy, and countless others: I am so appreciative for your support and friendship. Thank you.